Sometimes things just don't work right. Here are some issues we've found and how we can help you with them. 2. Problem: Saved Baskets - Can't See a Basket you started. Currently, the system automatically saves your basket for 60 days, as long as you are on the same computer. But Good News, you can save your basket to your account and view from anywhere. You can save a basket, in fact several. 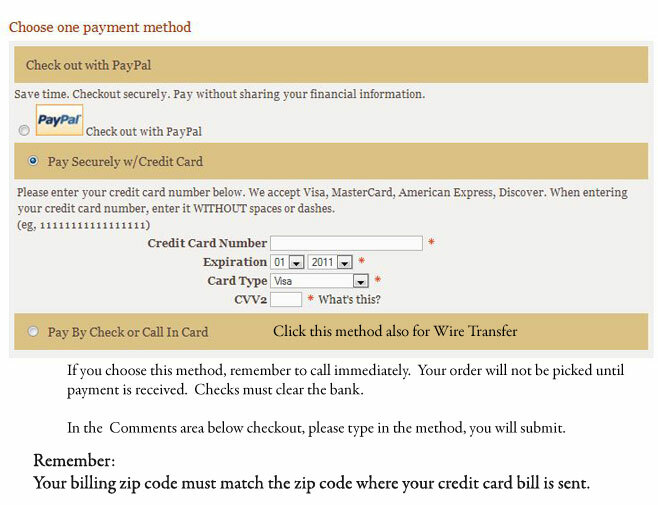 Click on the Basket Link, scroll down, there is an option to "checkout" or Save Basket, however you must register as a customer to save the basket. To view your basket, login into your account, scroll down and you will see the "saved baskets". You can also re-order from prior orders from the account screen. Clicking the reorder button will put all the items in your cart. You can then adjust, add, change quantities or delete. 3. How do I adjust the quantity in my basket or delete an item?" To adjust a quantity, type in the new quantity (greater than zero) and scroll to the bottom and click on the "Update Cart"
If you have a basket you can't find, email us and we can send you a link so that you can view the basket and restore it for shopping and ordering. We recommend creating your account and login before you begin shopping, that will help us identify your basket. 4. Problem. I use Firefox and it times out. Click on the "Account-Login" button on the top navigation bar. Scroll down and where it says "I have forgotten my password", type in your email address and the security code, then click on the "Reset my Password" button and a link will be sent to you so you can reset your password. Go to the "Contact Us" on the top navigation bar. Submit your full name and ask us to send you your login information. Please do not create a new account as your old history will not be present in the new account. Additionally if you are a wholesale customer, your access to wholesale pricing will not be in the new account. 7. Multiple Shipping Addresses: Do you need to ship to a different address frequently? Login to "My Account", scroll down, Use the "My Address Book" and click on the "Add New Address"
Give the new address a nickname that you can easily spot and save to your address book. From View Shopping Cart when you are ready to checkout, Click on the "Checkout Button" The same one you see below to the right of Update Cart. In the next screen, you will see the "Billing Address" and the shipping address. Use the pull down to select the nickname that you gave your alternate shipping address. The cart will add the shipping information. Be sure to check that it is correct. You can add multiple addresses - be sure to save with a nickname you recognize easily. 8. Problem: Can't check Out. On occasions when you cannot get past Step 1. of Checkout or even Step 2 or 3. (We have experienced problems between our server and certain browsers, notably Firefox and Safari where the software just doesn't play well together) Hopefully the software gurus are working to resolve this, however in the meantime. Call us a 1 800 439 3551 or email us at info@venetianbeadshop.com. We can locate your basket, take your credit card information and complete the order for you. NOTE: If you use Purchase Order, you must call immediately with your credit card information - orders are not picked until payment is made, which means we may run out of stock if you wait! 9. Credit Card Does Not Process. Verify that your billing address shown on your account is the place your credit card goes. We have fraud prevention on card processing and it verifies your address, and your zip code against your billing address with the card company. This is for your protection. After a certain number of attempts the system will reject your card. 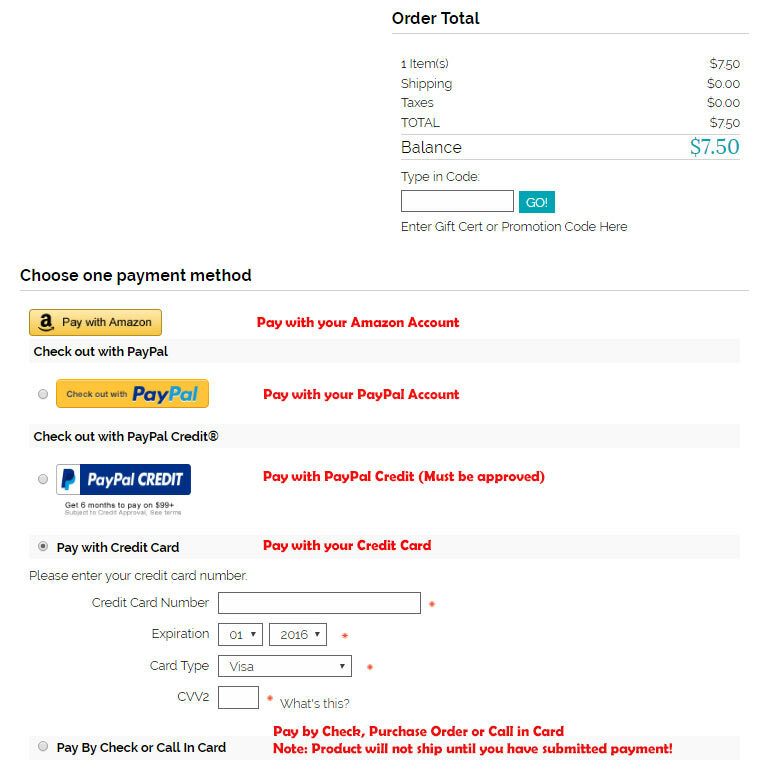 From the View Cart you can choose your payment method: Amazon, PayPal Account, PayPal Credit, Credit Card or Pay by Check. From the Checkout. First Verify your Shipping Address then select payment method. Your bank wants to be sure that the purchase is yours, not fraud. Sometimes, if you make several attempts, the bank, card issuing company will reject (decline) the transation. And sometimes if the dollar value is very large, they will also reject. The best way to resolve this is to contact your bank or card issuing company tell them that you are attempting to make a purchase with the dollar value and they can verify and make sure it processes. If you have difficulty, you may also pay with Wire Transfer. Please email us for our banking information if you would like to pay via Wire Transfer. From Australia, New Zealand, Japan, Singapore, HongKong and other Asian countries, it takes about 2-3 days for the funds to be transferred to our bank. From Europe it takes about 4 days.